The Hawaiian Island of Molokai is located southeast of Oahu. Not a main tourist destination, Molokai is famous for the work of a Belgian priest, Father Damien de Veuster, who cared for patients with Hansen's Disease (also known as leprosy) at the Molokai settlement of Kalaupapa on the island's north shore. Father Damien eventually contracted the disease himself, and died from it in 1889. The Hawaiian government quarantined sufferers of the disease, forcing them to live in the "leper colony" at Kalaupapa, until the segregation law was lifted in 1969. Today, there are reportedly no active cases of Hansen's Disease - which can be facially disfiguring (like this afflicted 24-year-old Norwegian) - on the island. Molokai - like the other islands of the Hawaiian archipelago - is the result of volcanic action. It has two now-dormant volcanoes - West Molokai (which is small) and East Molokai (which collapsed - catastrophically, volcanologists believe - eons ago, leaving behind a debris field at the bottom of the Pacific). What remains of East Molokai - its southern portion - are some of the highest (if not the highest) sea cliffs in the world. They were featured in scenes from the film Jurassic Park III. 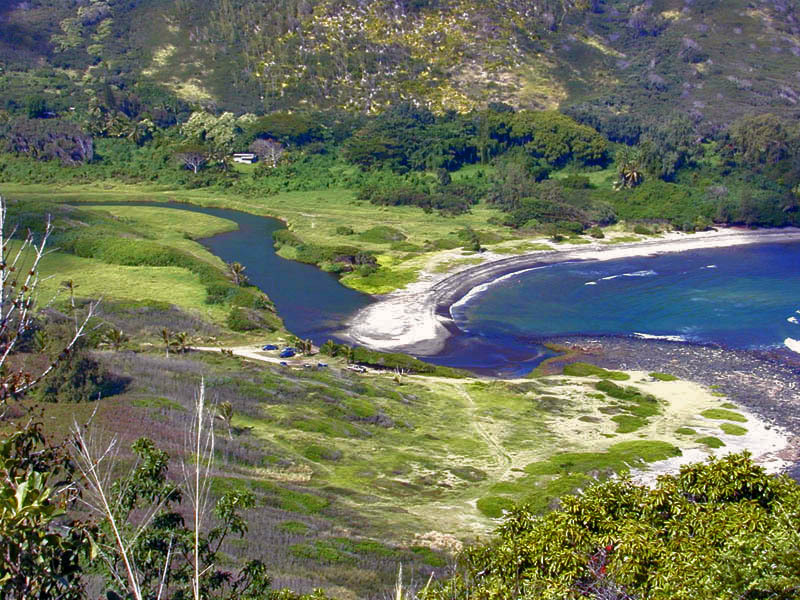 Molokai measures 38 by 16 miles and has less tourist-supporting infrastructure than some of its sister islands. Map of Molokai, online courtesy State of Hawaii. Bos, Carole "Molokai - The Friendly Island" AwesomeStories.com. Oct 07, 2013. Apr 18, 2019.